The accolade, which is awarded by Pulse of the City News and the Stirling Center for Excellence, is reserved for construction businesses and enterprises that continually provide uncommon service and exemplary finished products. This is the second consecutive year that DeckTech, Inc. has earned this five-star distinction. Pulse of the City News is dedicated to awarding professional building and construction services that have maintained the highest standards of quality work and customer satisfaction. Their researchers examine performance information from 2009 to now to create a comprehensive look at a business' work, reputation, and stature in the industry. Those businesses that receive four or five stars by the Pulse of the City News researchers are awarded their Customer Satisfaction Award. DeckTech, Inc. has been serving customers in San Luis Obispo County for more than 25 years. Their trusted, licensed contractors are industry leaders in deck construction, design, inspections, repairs, waterproofing, and installation. They also assist in local real estate transactions by ensuring the structural and waterproof integrity of decks before a sale of a property is finalized. Beyond the unparalleled work that they do, DeckTech, Inc. has built a reputation for honesty and transparency when dealing with customers. The DeckTech, Inc. team sets efficient, realistic project timelines with clients, uses the highest-quality materials on the market, and ensures that all clients are frequently informed and updated on the status of their project. 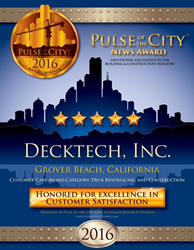 It is this diligence that has made DeckTech, Inc. a worthy, multiple recipient of the Pulse of the City News Customer Satisfaction Award. We congratulate the DeckTech, Inc. team for yet another industry recognition and know that they will continue to provide distinctive, high-end deck contracting services to residents and businesses throughout San Luis Obispo County and beyond. DeckTech, Inc. is a trusted and industry-recognized deck contracting company serving San Luis Obispo County and all surrounding areas. Specializing in moisture intrusion, their comprehensive scope of construction, design, and inspection services have beautified and fortified homes throughout Avila Beach, Pismo Beach, Arroyo Grande, Morro Bay, Cambria and beyond.